During the month of October, Boulder will be alive with Month of Modern (MoM). Founded as a celebration of architecture, design, lifestyle, art and culture—MoM’s mission is to cultivate a conversation about Colorado modern, and present the Boulder region as one of the nation’s most vibrant hubs of modern design. Over the course of 4 weeks Month of Modern hosts featured speakers, fire-side chats, film nights, thought-provoking panels and a fantastic wrap party – all designed to educate, inspire and delight. Month of Modern also partners with a non-profit organization to help raise funds for a particular cause. This year, a partnership was formed with the Colorado Green Building Guild, an organization dedicated to developing and implementing green building education to transform the market place to make green building common practice. We are proud to support this event because we want to celebrate the businesses, organizations and individuals who elevate industry standards and drive the modern movement forward. You can visit monthofmodern.com or follow Month of Modern on Social Media. Either way, Cornerstone Homes remains committed to creating a better awareness of Colorado modern design and design as a whole. Grab a ticket and come play with us! Join us for an evening of cocktails, food, music, and good company as we celebrate the region’s most acclaimed names in modern design. 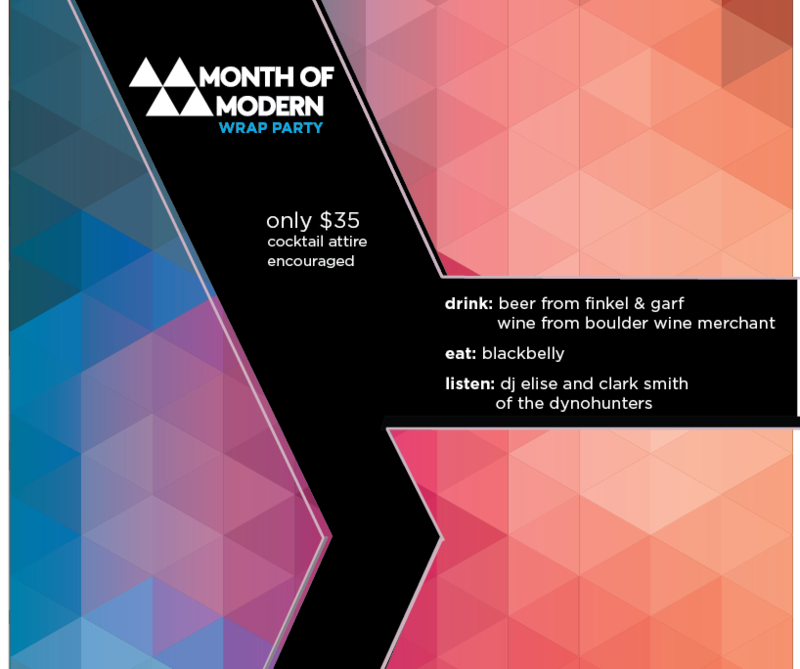 This years Wrap Party features multiple bars, local cuisine, great music and more!